This is my first weeknote on Medium, but I’ve been doing weeknotes on our internal blog since January this year. I’ve also been blogging on and off since 2006 on my personal blogs. (The main one being https://www.themself.org/ which has a little over 600 published posts). I’ve decided to do these on redleader and Medium so that people I’m working with outside the Department can also read them. I’ve fallen a little behind with my weeknotes and blog. I had almost a month off sick in the summer and I’ve spent the last three months or so catching up. I don’t quite feel that I’ve got there yet, but I’m getting closer. Close enough to write things again. I worked at home Monday and Tuesday because my wife went to her Uncle Ernie’s funeral in Cleethorpes. I also did a little work at home on Wednesday even though it’s officially my day off because I worked short days Monday and Tuesday to attend my daughter’s school play. (Twice, once just to watch and the second time in the front row with a video camera so that my wife could see it too). Planning how to introduce Success Profiles recruitment for the Project Delivery Profession in DWP. We’ve got a lot of current campaigns on, sifting 800 applications, and we need to keep on recruiting to fill hundreds of project vacancies. The main brake on this is finding people with the training in the new style who are confident with it. We also don’t want people to be mixing styles, that way leads to confusion and mistakes. So we’ve identified a role, and more importantly a panel to do the sifting and interviewing. The panel members understand they’re guinea pigs and we’ll be giving them extra support and watching closely to learn how to expand this to others. Attended the Reducing Parental Conflict programme board. There wasn’t much to say on this. The programme is reconfiguring because it’s transitioning to implementation. The Change Leaders Forum was on Tuesday. We spent most of the time I was there talking about the board level reorg occasioned by three vacancies on the Executive Team coming up. The general conclusion was that it didn’t directly impact on any of the major projects that we’re delivering. However there are probably some opportunities for us to approach some things differently to alleviate some of the frustrations we feel, not least in sharing people across major projects. I dialled into the Project Delivery Resourcing Board hosted by the Infrastructure and Projects Authority (IPA). Main topics there were recruitment of project delivery professionals and also assessing capability within the profession. I shared our plans for success profiles with the other departments and took notes for the team on the others updates. I also volunteered one of our team to liaise with IPA on the capability assessment project. Approved five lots of reward and recognition for team members who went above and beyond what was expected of them over the last month or two. Because I was working from home I had time and space to translate my ideas on Free Agents for OneTeamGov into a series of Google drive documents. I then shared these using twitter with some people that had said they were interested. We'll need more unicorn stickers for the whole group of free agents! It's a work in progress, feel free to comment and add. There's also some extra stuff about practicalities not yet included until they're sorted. Thursday was another half day, a mere four hours or so. The biggest chunk was sent sifting for G6 Project Managers in London. We had 28 applications to agree scores for. There was a pretty strong field, more than half were good enough to want to interview. However we’ve only got a couple of jobs, so only those near the top of the scoreboard will be getting interview invites. The other big thing on Thursday was a team lunch. All the London based members of the team went to Bill’s near Victoria for lunch. The team are pretty spread out, and the Leeds and Newcastle contingents also went for lunch on Thursday. I’m not sure if the Sheffield or Blackpool people are planning anything. It was an enjoyable lunch with lots of good non-work conversations. After we’d finished eating I retired promptly telling them not to go back to the office. This has been an eventful week outside work. The start was a trip with my son (13) to see Neil Gaiman recording a radio show for Radio 4. We went up early to make sure we got good seats, and ended up in Foyle’s. 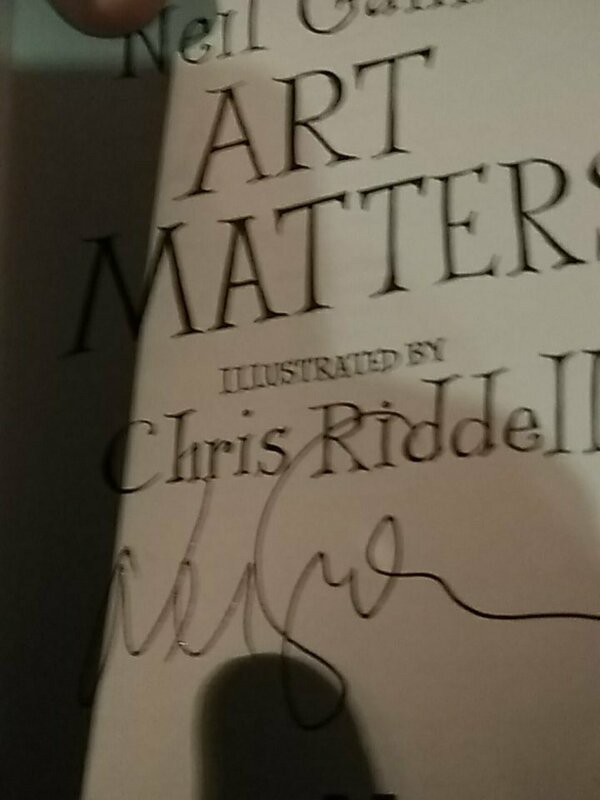 So a copy of vol.1 of Sandman and Art Matters later we wandered off down Oxford Street to the BBC radio studio. We ended up sat right in the middle of the studio, in row seven. When Neil Gaiman came out with the cast we were delighted. He had Peter Capaldi, Mitch Benn, Nina Sosanya and John Finnemore with him. Also four members of the Ukulele Orchestra of GB. It was an awesome performance, and I’m looking forward to listening to it again on Christmas Day. On Sunday my wife went to her Mum’s to help with the last minute arrangements for her Uncle Ernie’s funeral. Ernie died on Sunday 2 December, he was 82 and a veteran of the Malayan emergency. My mother in law was his youngest sister and his chosen next of kin. Monday and Tuesday involved watching the school play that my daughter (6) was in. It was one of the better school plays I’ve been to. The staff had mixed the Nativity with Top Of The Pops. So there were six ‘groups’ each with a song. Audience commentary from other kids and also an interviewer. My daughter was then unwell from Wednesday. She spiked a fever at just over 39C. Mostly she spent Wednesday asleep on the sofa. Fortunately my wife, who is a senior nurse, came back home mid afternoon on Wednesday. Thursday was the end of term for the new cub pack we’ve set up on Thursday evenings. Having started with an open evening, followed by taster sessions we’ve recruited one adult to become a leader, with another interested in helping out. We also have eight young people. On Thursday night we invested James, who is going to be the Akela, and the eight young people. So now we have a working cub pack on Thursdays, and space for more young people and a few more adult volunteers. I left cubs slightly early to make it to my son’s play with the drama club at the school. 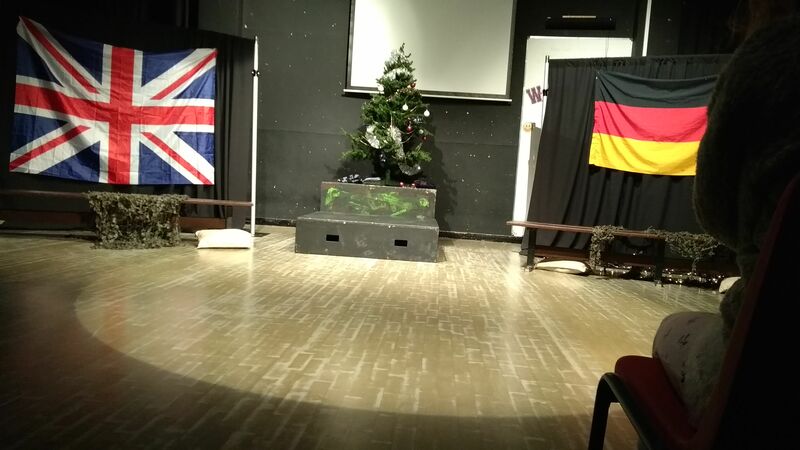 They had a WW1 themed play about the Christmas Truce. Friday was a day off, originally to do stuff with my wife. However I ended up looking after my daughter who was still too poorly to go to school. This entry was posted in work and tagged Free Agents, Neil Gaiman, OneTeamGov, Project Delivery Profession, Recruitment, Success Profiles, weeknotes by James. Bookmark the permalink.